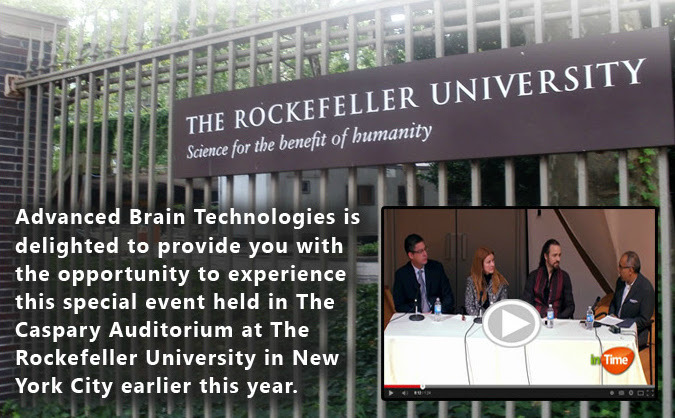 During the launch of inTime earlier this year we were very honored to have The Rockefeller University host us in their Science and Lecture Series for inTime: Intercultural Rhythms, Music, Sound and Science. The event was a panel discussion with fellow inTime producers Sheila Allen, Nacho Arimany and me, moderated by neuroscientist Dr. Kamran Fallahpour. Following the panel inTime music composer and multi-instrumentalist Nacho Arimany treated us to an incredible concert of his original world-music compositions. Why am I sharing this with you now? Well, our friends at Ferro Productions and Attitude Post filmed and edited the event into a 15 part video series for us at Advanced Brain Technologies. And I’m thrilled to share it is now available with full access for your online viewing! You can watch the Introductions (Part 1) here, then go on to view the other 14 parts at your leisure! I certainly hope you enjoy the series and learning more about inTime , a rhythm-based music listening method developed to influence brain performance and to stimulate changes in focus, rhythm & time, and stress response. In November I decided to take a hiatus from writing posts so I could focus with a really awesome team of people to launch two exciting products for Advanced Brain Technologies and Sleep Genius. One of these launched in February. It is a rhythm-based music listening therapy called inTime and I must say it is incredible! I couldn’t be happier about the response to it and the stories I am already hearing about the lives it is touching. More on that in-time… The other launch is happening this Friday, and I can hardly wait to share that one with you. If you have difficulty sleeping, you definitely want to stay tuned. And the best way to do that is to follow this blog via email. You’ll find the sign up on the top right of this site. Just type in your email address. It’s super easy! Those who follow this blog and my work will know that my focus, besides my amazing wife and kids, is on elevating people’s lives by helping them achieve and maintain their sound brain fitness. This is akin to physical exercise making us healthier. 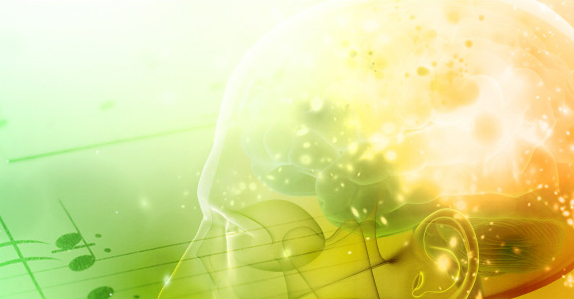 To help make the brain fit and performing at its best, you can engage in healthy sound practices which include avoiding noise as much as possible to preserve hearing and reduce stress, and by having a daily listening practice with music listening therapy to feed your brain with the sounds and music it is so hungry for. I can tell you it is absolutely incredible what just these two lifestyle changes can do to help you live a healthier, more productive and happy life! Did you know that music can change how your brain works? If you didn’t know, I want you to, because that knowledge can transform your life! To learn more about this idea you might enjoy reading about a recent study at the University of Liverpool that has shown that even brief musical training can increase blood flow in the brain. This research also adds to an existing evidence base that suggests that areas responsible for music and language share common brain pathways. Pretty cool right? How right Confucius was. What got me thinking about this quote was this picture of my son Brendan. My wife often sends me photos and videos of our family when I am at the office or traveling on business. A highly effective ploy to get me home. 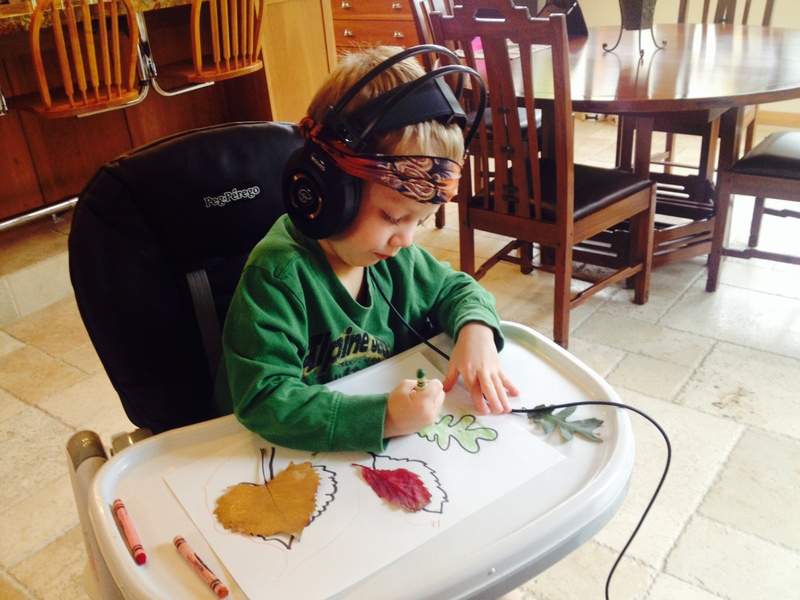 Today’s image of Brendan listening and coloring autumn leaves as we begin the rhythm of the fall season gave me a feeling of immediate gratitude. Appreciation that each day when I wake I GET to do what I LOVE. Why do I love my job? I am surrounded by amazing, brilliant, caring people. And what we do as a collective team touches lives through listening in meaningful and often profound ways, including my own family. Case in point. My son is among dozens of participants in a preliminary clinical trial investigating the benefits of a rhythmic music listening program we’ve been developing over the past several years. He is listening to intercultural rhythms and music that in just a few short weeks appear to have made a dramatic shift in his brain sparking his imagination, musicality, communication, planning, play, rhythm and timing. And, I’m hearing similar reports from others. Many of which are transformational, giving me great excitement to see what range of benefits may come for the kids and adults who are involved in our research. It’s the results that drive me to do the job I love, and the reason why I will never have to work a day in my life. Do Drum Rhythms Affect Brain Rhythms? 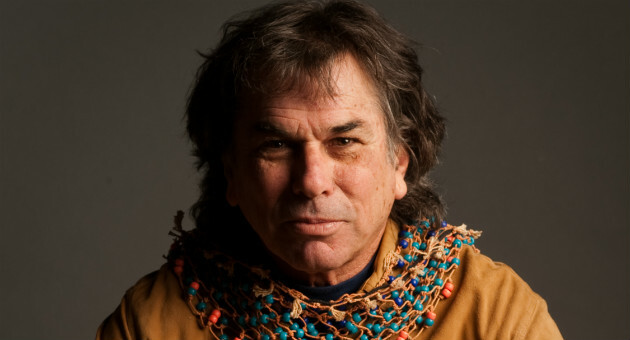 Today is Mickey Hart’s birthday, and now at 70 years young he shows no signs of slowing! In July I shared a bit about “Drum Ki” his fine art collection that utilizes sophisticated technology to create a new medium translating rhythm to visual art. The image you see above “The Sermon” is part of this collection and hangs on my office wall as a daily reminder about the meaning of rhythm in our lives. 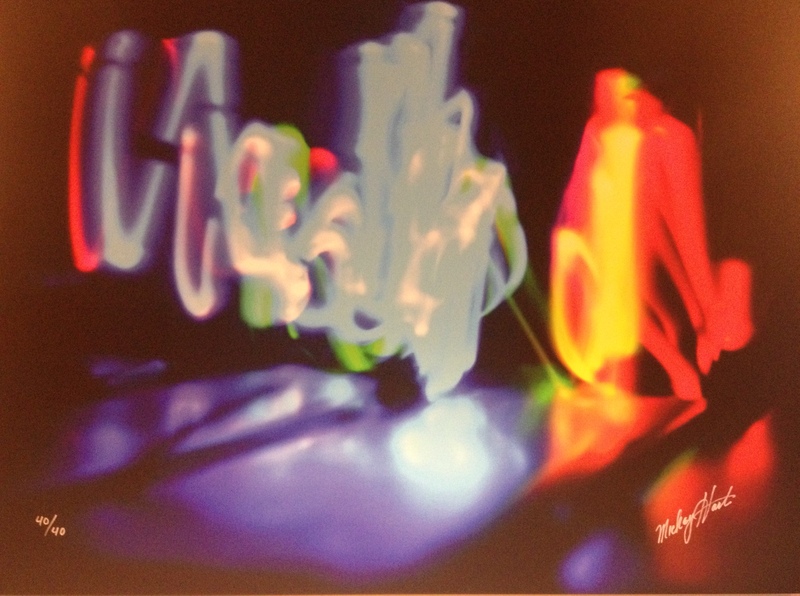 Now not only can you see Mickey Hart’s rhythmic art, but the brain that creates it. Watch the Grateful Dead Drummer’s brain scanned with an EEG while he plays drums! UCSF neuroscientist Adam Gassaley is working with Hart to investigate if enhancing someone’s sense of timing might improve their cognition. VIDEO– Learn more in this ABC News report. Research has shown that music training improves the brain’s ability to recognize, perceive, and make time sensitive movements such as speech production. Do drum rhythms affect brain rhythms? The answer is yes. This is a core sonic principle called entrainment which I wrote about in Healing at the Speed of Sound with my co-author Don Campbell. What we don’t yet understand is to what extent, and all the mechanisms involved. There is much left to learn. We have our own brain rhythm project happening at Advanced Brain Technologies, now five years in the making. Currently we are conducting research via a preliminary clinical trial in which children and adults listen to specially created rhythmic music twice daily through headphones to explore what kind of neurological changes may come using qualitative and psychometric measures. We are eager to see the outcomes. Given our efforts in applied music cognition research we are also excited to learn what will come from the Hart/Gassaley collaboration. Dead Heads and fellow art collectors rejoice! Mickey Hart has revealed an intriguing way for us to visually experience rhythm and I’ll tell you about it a bit later in the post. Some 24 years later I can’t say I recall all the details of that trip, and if I could, better to leave some things unsaid…What I can share is that it was a short, but epic journey, and everything a youthful adventure Road Trippin’ should be. In the cycle of two California sunsets I came to understand why the faithful followed these iconic musicians across the globe—Vibe; the rhythm of music and community. At this moment I’m listening to the recording of Grateful Dead from that very concert. VIDEO The music is recalling the vivid sensory experience of this episodic memory from the deep recesses of my hippocampus. Central to this recollection is the vibratory pulse invoked through Bill Kreutzmann and Mickey Hart’s rhythms. Mickey’s creative spirit has taken him down many paths. The latest is “Drum Ki” a fine art collection that utilizes sophisticated technology to create a new medium translating rhythm to visual art. I find it to be extraordinary; a visualization of the invisible, rhythmic waveforms created with percussion then captured onto canvas. Recently I completed production on many hours of percussion forward cross-cultural music with my colleagues for a rhythm-based music listening program. Rhythm has been the central theme in my consciousness. Just this morning I was analyzing the real time visual waveforms of our music when I went online and viewed a piece in Hart’s collection called The Sermon. I was struck as happens when I’m called to a piece of art. For me it symbolizes the deeper meaning of our project; to find our pulse, the rhythm within ourselves and our environment. See it here. If you’re interested to learn about our rhythm project I’ll be presenting it with fellow producers Sheila Allen and Nacho Arimany at the Interdisciplinary Society for Quantitative Music and Medicine Conference 2013 at the University of Georgia later this month. Presentation Abstract. Explore Mickey Hart’s ‘‘Drum Ki” and share in the comments if you’re drawn to this collection too. I’d love to know and if so, which piece speaks to you.